Sustainability was the key factor when the new 72,000 square foot, $19.1 million addition to the Liberal Arts facility at Southwestern Illinois College was envisioned. A component of this new building design was to include an outside second floor terrace area for patrons of the new coffee and sandwich shops to utilize for dining and relaxation. However, with a Southern exposure on the deck and Mid-Western summer-time temperatures often exceeding 95 degrees F, some type of shade system was a must. 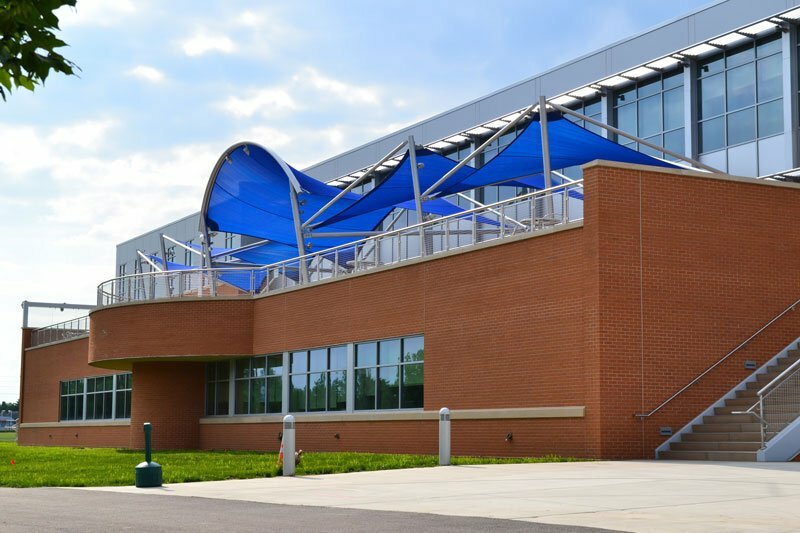 The design team contacted Lawrence Fabric & Metal Structures, Inc. of St. Louis, Missouri to assist them with a concept and detailed design drawings for a new tension-structure that would provide solar protection and create a comfortable, relaxing atmosphere for students and faculty using the space. 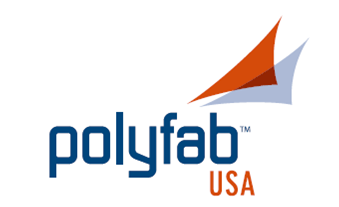 The result was an interconnected, 135’ x 35’ steel-framed structure supported by 13 vertical steel columns holding nearly 2500 square feet of Polyfab Architec 400 Aquamarine shadecloth. 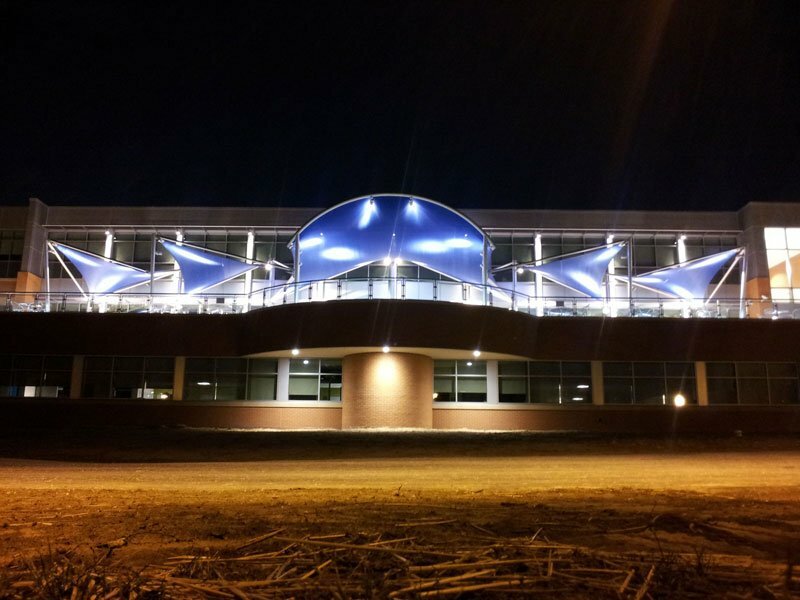 The structures’ unique overall shape and lighting effects enhance the appearance of the building both day and night as well as highlight the colors of the official school logo. The team at Lawrence Fabric utilized several new technologies in order to complete this project in spite of some complex requirements. Anchored solely to the structural steel of the second-floor deck it sits on, special column “boots” were developed and welded in place prior to the final pour of the concrete deck and a pedestal pavers system. A new liquefied membrane roofing system was then applied to completely seal the connection points as the space below the deck is full time classroom and study space. 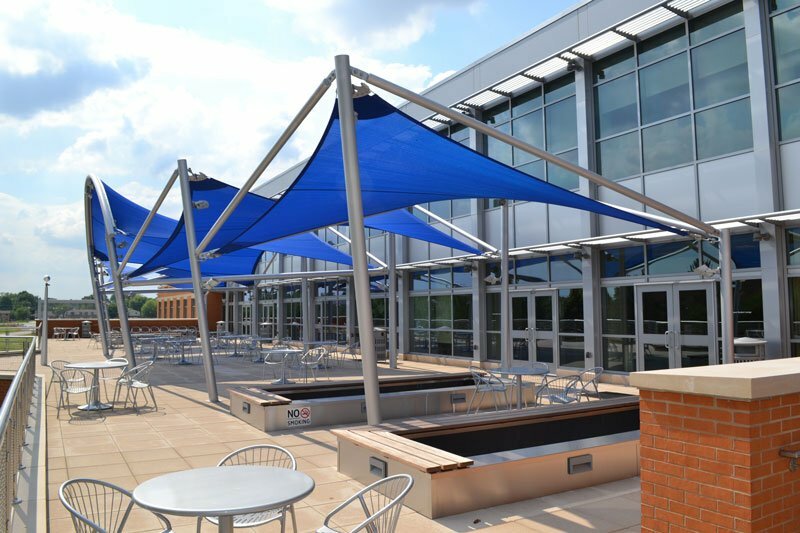 This would allow the structure to flex slightly during high wind events, while remaining completely weather-proof for the occupied spaces below. The remaining support structure would be brought in much later following the construction of the building itself and be assembled for the first time ever on-site. To ensure that everything fit as planned, Autodesk Inventor software was utilized to design the framework and steel connection components. 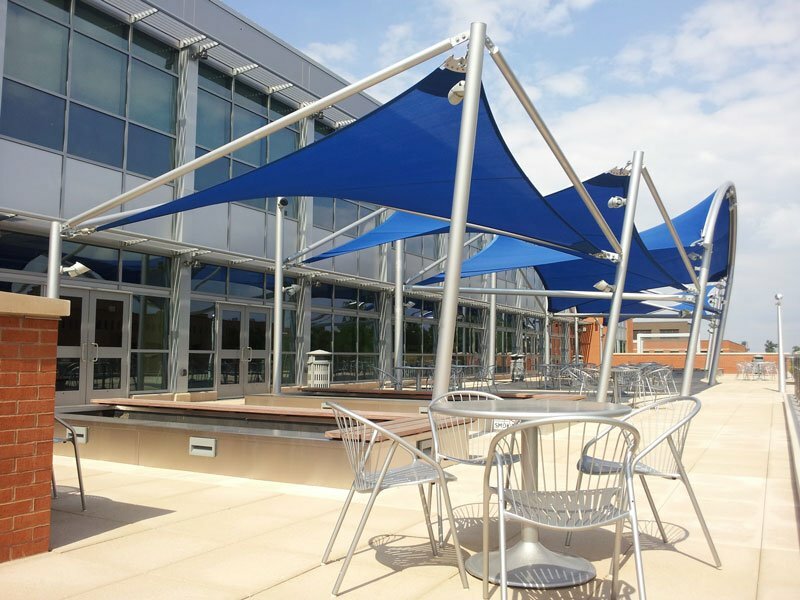 The design team then chose MPanel Software by Meliar Design to layout and pattern the fabric for each of the five shade sails as well as 21 different corner plate configurations. The software was even able to instantly provide accurate point-to-point cut lengths for each of the perimeter cables making for speedy production of all the components. Even though the tolerance was less than .25” over the entire 135’ distance, the fit was perfect the first time up with no modifications required to any component. To ensure that this structure would survive all types of weather, a complete structural engineering study was completed by structural engineer Gary Foreman, PE SE AIA PA of Ft. Myers, FL. He used MPanel FEA (Finite Element Analysis) software and RISA-3D to test various scenarios of wind and snow loads to help determine the proper sizing of the steel columns and perimeter cables. Although not known then, this structure would be severely tested by both of these elements soon after it was installed, and would weather each storm with flying colors.